You’ve probably heard someone refer to “tasting” a domain name, but may not understand what it means. Let’s compare it to wine – which, quite ironically, also involves tasting. You’re presented with an array of ten bottles of wine, all falling within a similar price range. You don’t know anything about the wine just by looking at it. Additionally, you know that what stands between you and getting the full experience and enjoyment of that wine is to buy the bottle, open it, and drink it. This might involve an expenditure of $40, $400, or $4,000. If you know a thing or two about wine, you have a sense of what you like. If presented with a new wine, as intrigued as you may be, you’d prefer not to buy the whole bottle without tasting it first. You sip, and if it’s good, you buy it. If it’s not, at least you tried it and it didn’t cost you anything. Instead, you’re off to the next bottle, better informed, and now even more eager to find the right one. This is hardly dissimilar from domain tasting. A given domain name might appear to be extremely appealing to a domain name investor. It is very well possible that investor might want to buy the domain name, keep it renewed, and watch the profits flow in from parking revenue or monetization. But, while the “bottle is still sealed”, so to speak, the investor has no way of knowing whether this will be a $5,000 per month revenue stream for him or a complete dud. In order to assess the domain name in a risk-free manner, the investor is able to go ahead and register the domain name – effectively allowing him to receive the benefit of whatever traffic might come his way. The beauty of it, however, is that within five days of registering the domain, they have the option to either delete the domain name and have the registration fee refunded, or keep the domain name, if it appears to be a worthwhile. That five day period is kind of like the small portion of wine in a tasting glass. It gives you a sense of what the “whole thing” is like. It’s risk free, in that it does not cost you anything to assess either the domain name, or the wine. And any revenue that comes from the domain name in its tasting period goes into the domain investor’s pocket. 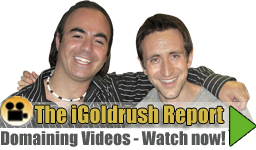 Since it is so easy to scale this practice into hundreds or even thousands of domains (e.g. 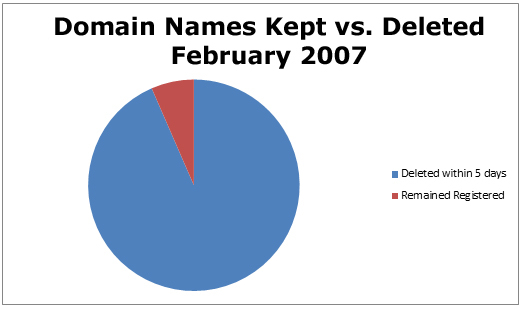 to register 5,000 domains and drop 4,970 of them five days from now if only 30 of them work out), it causes the figures for domain names registered to appear substantially inflated in comparison to domain names that stay registered. 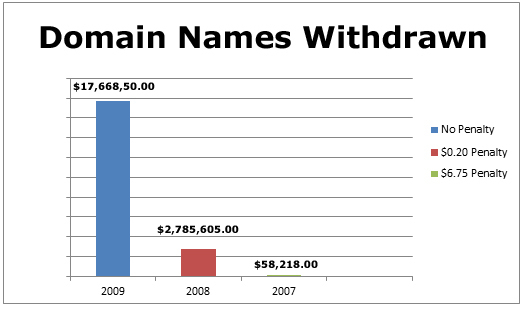 According to Godaddy.com CEO Bob Parsons on his blog, in February 2007, 55.1 domain registrations took place. That’s close to two million domain names per day. However, over the course of February 2007, 51.5 million domain names were deleted and refunded within five days of having been registered. Indeed, 93.47% of all domain names that were registered, were dropped, being simply not capable of turning a profit for whomever it is that invested in them. This is not to say that such domain names are utterly useless. It is very possible that they may contain keywords that are useful to an end user, or maybe even a mini-site builder, who can leverage those keywords with the right content to drive some traffic to a web property built on that domain name. So, there you have it. For the same reasons you’ll assess a bottle of wine’s worthiness by tasting it first, a domain name investor will assess a domain name’s worthiness by giving it a little bit of a “taste”. Domain kiting is similar to tasting – it is a practice that follows the “taste” of a domain name before committing to it. If five days wasn’t enough for a domain investor to determine whether or not registering a given domain name will be a winning proposition, and he doesn’t want to incur the registration fee if the keeps it for more than five days, he will delete the domain name, and then immediately re-register it, renewing the five-day period so that he’ll have another five days to “taste” the name. Now, you can imagine that domain name registrars weren’t too happy about this. Who wants a returned product rate of 93.47%? Furthermore, how is it fair to them that domain name investors can use their resources and potentially make some money without guaranteeing any revenue for the registrar? In 2008, ICANN stepped in and imposed some new regulations to curb domain tasting and domain kiting. They allowed registrars to delete up to 10% of their registrations without penalty. Anything above that would incur a penalty of $0.20 per domain. Which doesn’t seem like much – but considering it’s a leap from a $0 penalty, it means that now to drop, say, 500 domains, will now cost $100 to do. After implementing this policy, in less than a month, the volume of withdrawn domain names took a sharp drop from 17.6 million domains in June 2008 to just over 2.7 million domains in July 2008. A year later, when the penalty was hiked up to the full amount of the registration fee (meaning it would cost the same to keep the domain name as it would to drop it) barely cleared 58,000 – less than 0.33% of the deleted domain quantity of just a year earlier. Needless to say, domain name tasting and domain kiting are not as profitable of a practice as they used to be. But they were once an extremely lucrative way of doing things, and played an integral role in the evolution of online commerce.